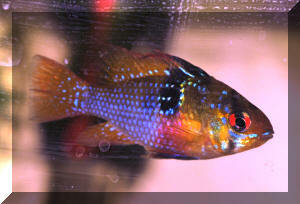 The Dwarf South American Cichlid Microgeophagus (formerly Apistogramma, Papilochromis et al.) 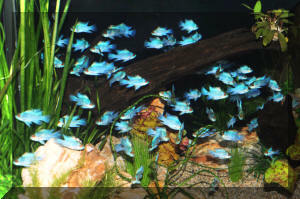 ramirezi, the Ram, is a quintessential aquarium fish. Staying small enough for most all aquarists use, not being overly demanding in its food, or overly aggressive, or impossible to breed in captivity, you'd think this would be a "standard", found in every fish store in the land. Alas, this is not so. Unfortunately this small beauty has a liking for more tropical temperature, softer and acidic water than many localities provide out of the tap. As such, the Ram or its xanthic varieties like the Gold Ram is best either housed in a "species tank" dedicated to itself or even better, a biotopic presentation with water quality, plants, lighting and other fish species found in its natural habitat. Some writers have kept and bred this species in systems as small as five gallons. I suggest at least twice this gallonage, or better, much larger if you're not interested in maximizing reproduction, to observe more than just one pair interacting with others of their kind and other species. Some lighting is recommended for your viewing pleasure and live plants if employed, but nothing too consistently bright. 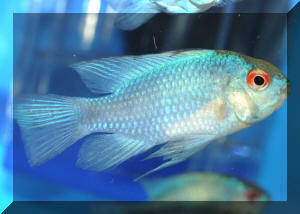 A major failing point in this fish's care and keeping is too hard, alkaline or cold water. Even if you're not trying to breed and rear young, Rams need soft (to medium hard) water of low pH (5-6 is ideal) and water in at least the low eighties F., preferably the mid to upper eighties F., particularly if you're trying to breed them. Metabolites are also an issue with keeping, breeding this fish. As little to no detectable nitrate is ideal, and of course no ammonia or nitrite. These conditions are possible to achieve with demineralized water (by itself or mixed with tap), peat use (in the filter flow path) and frequent partial water changes... as well as by having large systems with live plants, sparse feeding and stocking. 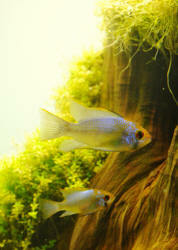 By and large Rams are good community fishes, rarely bothering any but the smallest of tankmates. However, they themselves can be easily overwhelmed by other animals that are too active or over-eager feeders. Plants should be selected (if used and this is encouraged) which likewise enjoy or tolerate warm, soft, acidic waters (e.g. Nymphaea, Mayaca, Echinodorus, Cabomba furcata). Do consider setting up a biotopic presentation with Rams as the focus. There are few "stock" aquariums as gorgeous as a richly planted "llanos" (freshwater savannah pools) with submerged wood, small groups of characins, Corydoras cats and Rams. Heckel Discus and wild Altum Angels can even be mixed with Rams. At any length, using small tetras such as pencilfishes, smaller barbs like the gold, checkerboard or cherry or smaller Danios as "ditherfish" is strongly encouraged to "draw out" the shy Rams. Until you've seen a well-conditioned Ram in its full glory you won't know why this fish is also known as the Butterfly Cichlid. Ones that have been fed a mix of meaty foods, chopped, frozen/defrosted or live can be exquisitely beautiful, with iridescent blue, green, red, orange and yellow highlights. Pairs are best "made" here as with other larger neotropical cichlids by buying several small individuals and allowing them to match up with time. Males of equal upbringing care have more pointed and long dorsal fin spines, particularly the third. Right before spawning, females have distinctively red abdominal regions. 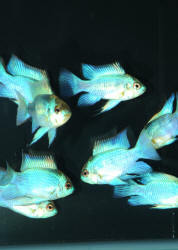 Many shipments from captive-produced stocks from Singapore and Czechoslovakia have most or all male individuals to suit the market. Wild specimens are available from Colombia from time to time, and these are suggested for broodstock. Spawners should be supplied with a few flat rocks and real or plastic broad-leafed plant cover. Many writers suggest raising temperature from 82-86 to the upper eighties F. to instigate spawning. The placement of the Ram out of the genus Apistogramma is somewhat based on its difference in spawning behavior compared with those other dwarf cichlids, which are cave or shelter spawners (Rams spawn out in the open on rocks, leaves, even gravel... maybe covering the spawn with it if it's fine grade). Up to five hundred eggs are laid in small batches, fertilized by the male and cared for by both parents. Rams are notably such bad egg-eaters that it is suggested that you locate their spawning tank out of outside traffic, or cover the sides with paper... and provide "dither-fish" (like zebra Danios) to reduce stress. This latter technique and possibly leaving some light on or near the aquarium may help with keeping these notorious spawn-eaters from consuming their young. Some breeders remove the male as his role is largely territorial in nature, others remove both parents or the young and rear them separately, hence avoiding their consumption by the parents. Young hatch out in about sixty hours and are moved about in shallow depressions made by the spawners, becoming free-swimming in about four days. The fry may take newly-hatched brine shrimp or Cyclops, but a good starter food is the tried and true infusoria or micro-worms that are easy to culture at home. The wild type of this species is definitely more hardy than the two yellow hybrid "golden" rams one finds in the trade. And though most all Rams sold in the pet-fish trade are produced in the Far East, there are still occasional imports from the wild (usually from Colombia). Whichever source or origin, it is not uncommon for Rams to be infested with internal and external parasites on arrival. Cursory treatments by dealers and hobbyists for Hexamita, other protozoans and possibly nematodes is suggested. This routine can be most easily carried out in secluded quarantine with the addition of Metronidazole (Flagyl) and possibly anthelminthics. Do provide sufficient decor/cover in the quarantine setting, subdued lighting and regular water quality monitoring and changes. Starting off with a bang of popularity since it was first imported into the United States back in 1947, the Ram continues to be a small "hit" with its own niche market. 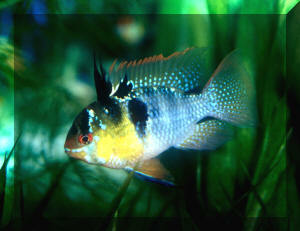 Given subdued circumstances, warm, soft, acidic water and not too-rowdy tankmates this dwarf cichlid is a winner. Though not a good "beginner fish" due to its shy nature, need for more specialized water quality, Rams are definitely worth keeping. Blue or wild ones, one of the golden varieties, with regular or veiltail fins, the Ram is an easygoing, non-digging, plant-uprooting beauty... just with special (that is, usually non-tapwater) requirements. Bailey, Mary. 2001. 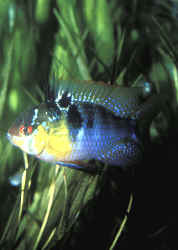 Microgeophagus ramirezi remains a hobby favorite, although keeping it can be tricky. AFM 4/01. Burgess, Warren E. 1982. It's Microgeophagus! TFH 6/82. Leibel, Wayne S. 1998. A ram by any name is one beautiful dwarf eartheater. TFH 10/98. Loiselle, Paul V. 1995. Blue ram. Beautiful, small and peaceful- what more could you want? AMF 5/85. Loiselle, Paul. 2001. Breeding rams. AFM 3/01. Miller, Justyn. 2003. 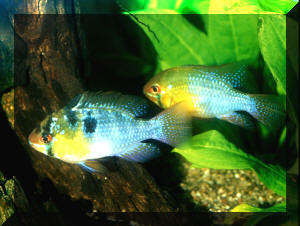 Cichlid addiction. FAMA 1/03. Newman, Lee. 1999. Keeping and breeding wild Columbian rams. A colorful dwarf cichlid. AFM 6/99. Richter, Hans-Joachim. 1987. The ram. TFH 2/87. Strange, Arthur. 1985. 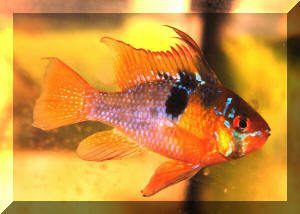 Breeding Apistogramma ramirezi. A study in fish behavior. FAMA 5/85. Tavares, Iggy. 1996. 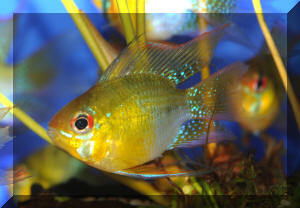 Cichlids for the small aquarium. The ram. FAMA 5/96.